Meet Houdini Carini, girl magician! Houdini just wants to be a “magnificent magician” but everything seems to keep going wrong. Houdini’s escalating series of tricks gone awry involves the entire town until she finally learns the secret to great magic. A humorous picture book for ages 3 – 5. Bonus content includes illustrated instructions for a real trick beginning magicians can do. How to Buy for Individual Customers: Houdini Carini is available from Amazon.com or by special order at your local bookstore. Anne Zadek clearly understands children, who will relate to Houdini’s eagerness to skip the difficult parts of a task for more immediate gratification. 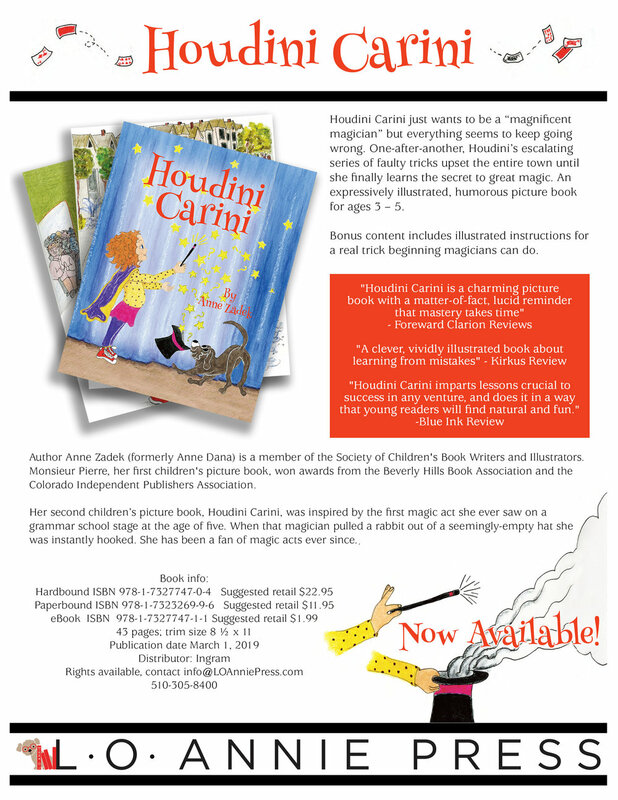 The young progeny of magician parents learns that patience is a virtue in the entertaining children’s picture book Houdini Carini. After watching her parents perform their magic act on stage many times, Houdini Carini expresses interest in becoming a magician, too. For her birthday, her parents give her a humorously enormous book with the equally gigantic name Complete Encyclopedia of Amazing and Astounding Magic Tricks You Can Learn in a Lifetime. Houdini doesn’t want to read such a huge book and figures she's seen magic her whole life— how hard could it be? Her attempts at performing several advanced tricks fall flat, however, and when her parents offer to show her an easier trick, Houdini claims she "only does AMAZING magic, not easy baby tricks." After another disastrous attempt, Houdini finally accepts her parents' challenge to learn the very first trick in the book, and after much practice, she performs it successfully before an appreciative audience. Summarized in Houdini Carini's final words, the book's lesson is a valuable one: "Begin at the beginning. Start small. Practice makes perfect." Anne Zadek clearly understands children, who will relate to Houdini’s eagerness to skip the difficult parts of a task for more immediate gratification. Her writing is kid-level and effective, particularly the technique of splitting sentences across pages, which helps sustain momentum. Zadek's writing isn't perfect, however, with some missing or misplaced punctuation; similarly, her hand-drawn and hand-colored artwork is appealing but occasionally awkward, as when she shows Houdini's feet in an impossible position. Still, the book's enjoyable, organic quality stems from Zadek's illustrations, so a few missteps are easily overlooked. Zadek also explains a simple card trick at book’s end, using clear instructional drawings and text—a nice touch to a story that might inspire kids to learn magic themselves. In sum, Houdini Carini imparts lessons crucial to success in any venture, and does it in a way that young readers will find natural and fun. Also available in hardcover and ebook. Houdini Carini is a charming picture book with a matter-of-fact, lucid reminder that mastery takes time. 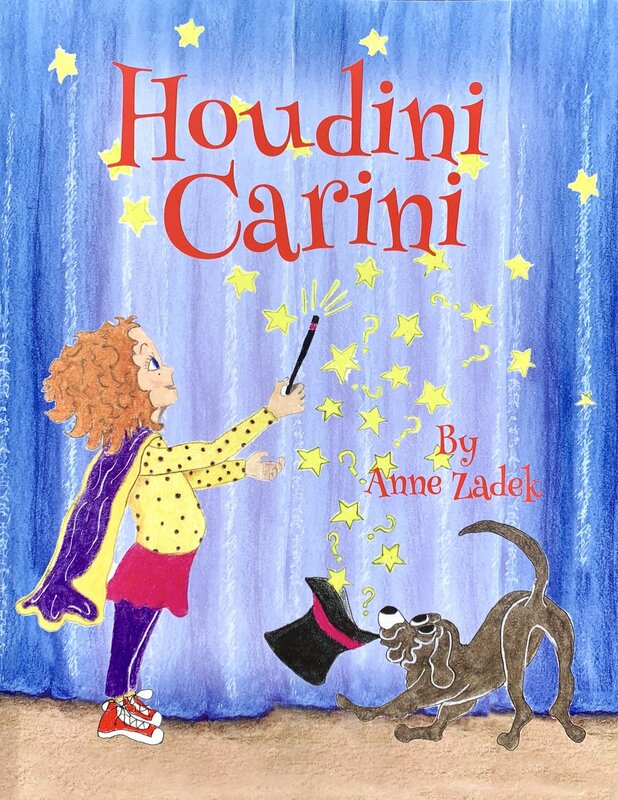 In her picture book Houdini Carini, Anne Zadek presents Houdini, an eager girl whose parents are magicians and who discovers that shortcuts lead to mistakes. It’s a timeless lesson for preschoolers that reveals the wisdom in slowing down and doing what’s often hardest: beginning at the beginning. Inspired by feats with fanciful names, like the Astounding Illusion of the Whispering Sphinx, Houdini decides to follow family tradition. On her birthday, she’s gifted a cape, wand, hat, and book. Not content to learn what she considers to be “baby stuff,” Houdini decides she’s seen enough magic to try advanced tricks. After a few failed attempts, her parents advise her to turn to the book’s first page, which states: “Begin at the beginning. Start small. Practice makes perfect.” It’s only when Houdini follows directions and puts forth effort that she finds rewards. With its gentle narration, the book never turns Houdini’s confidence into outright hubris. Her natural enthusiasm, realistic impatience, and innocence serve as motivation. Setbacks only push her to keep trying. The familiar message on learning new things one step at a time tends toward the formulaic; though the book centers on magic, the behind-the-scenes struggle keeps some of Houdini’s sense of wonder at a distance. Homespun, busy illustrations feature doll-like figures and clever details that highlight Houdini’s difficulties. The magic book, which she shoves under her bed, is nearly as large as the bed itself, suggesting its daunting nature. Scenes that include a deck of cards emphasize Houdini’s lack of control by scattering them across the page. Still, the art is not polished. In a show-and-tell scene, children’s hands vary in size and form, and feet cast unlikely shadows in a well-lit classroom. Tables and chairs alternate between curved and straight legs, thin and thick tabletops. Character designs are also inconsistent; Houdini’s father is lashless in most scenes but not in a dinner table tableau. The distance between a wall clock and a doorway shifts from one living room scene to the next. Houdini Carini is a charming picture book with a matter-of-fact, lucid reminder that mastery takes time. Houdini’s foibles and her parents’ honest guidance add up to a warm portrait of making magic. A clever, vividly illustrated book about learning from mistakes. A girl learns that practice makes magic in author-illustrator Zadek’s (Monsieur Pierre, 2017, as Anne Dana) picture book. Houdini Carini, the Caucasian daughter of stage magicians, can’t wait to be a magician herself. But when her parents give her a massive magic-trick encyclopedia, her first thought is, “This will take WAAAY too long.” She decides to perform a card trick, but instead of practicing it, she rehearses taking a bow; her resulting performance produces card chaos. Undeterred, she picks out another trick for show and tell, but lack of preparation results in hamsters all over the classroom; one of Zadek’s brightly colored ink-and-watercolor illustrations shows humorous expressions on the children’s faces. After another half-understood trick floods the streets with water (in a wordless, two-page spread), Houdini is miserable. She then accepts her mother’s challenge to master a trick from the encyclopedia’s beginning, and she finally realizes the value of practice. Overall, young readers will find Houdini’s enthusiasm relatable, and the expressive illustrations reveal both her actions and her emotions; they also show an array of different skin tones for secondary characters. For kids who are eager to jump into activities with both feet, the protagonist’s struggles with starting small are sure to ring true, and her hard-earned success is worth celebrating. The first magic act author/Illustrator Anne Zadek ever saw was on a grammar school stage at the age of 5. When that magician pulled a rabbit out of a seemingly–empty hat she was instantly hooked. She has been a fan of magic acts ever since.